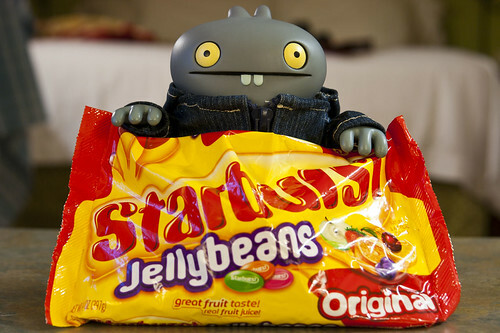 Uglyworld #1195 - Jellybeaners (Project BIG 203 - 365), a photo by www.bazpics.com on Flickr. I heards Baz talkerings on his mobile phoner that he may be luckiers enough to gets the whole weekender off as his workies is going goods, so I decideds that I hads better go to the supermarketer and buys him some goodies. I deciders to buys this huger bags of jellybeaners as I is thinkings to asker him if we can go visiters somethings mega cools with Cinko and Letterman on the weekender, but it is also mega far aways from here and so we needs to has plenties of snackers to munchies on during the tripper. I hopes that he is in a goods mood when I makers my suggestion on where we can goes, wishers me luck everyones...!! !